MKIA: Ms Schulist, first of all I would like to thank you for taking the time out of your busy day to do this interview. Ms Courtney Schulist: Thank you for allowing me to share our story. MKIA:When I heard your story, it deeply inspired me. I felt like I needed to bring this story to light, because it’s very inspirational and could inspire others. You are a single mother, with three special needs children. Your eldest son Kaia, was a preterm born at 29 weeks gestation. He is diagnosed with dysgraphia, dyslexia, tourette's syndrome, speech delay, and vision problems. Aybra, your daughter, was born at 26 weeks gestation. She is diagnosed with intra-ventricular hemorrhage, ROP with current vision problems, and speech delay. I believe Aloshua, who is your middle child, was born at 27 weeks gestation. He is diagnosed with spina bifida, hydrocephalus, Arnold Chiari malformation, mal rotation, diaphragmatic hernia, coloboma, GERD, failure to thrive, trach/vent dependent, neurogenic bladder, bilateral hernia, hydroceles, vitiligo, and dysphagia. I mean, just reading all these diagnoses, I feel overwhelmed. What gives you the energy, drive, and motivation to be able to meet the special needs of your children and the demands of your work as a single mother? Ms Courtney Schulist I do not feel like I have any special characteristics, which gives me an advantage in caring for my children or work obligations. I feel like I do the best I can, so that my children can thrive. When a person is placed into a situation like mine, then they must adapt. I have simply adapted to meet the needs of my family and work. Seeing my family thrive gives me pleasure. I work hard to ensure that their needs are met; often times putting myself last so that they can get what they deserve. I am motivated by their progress and success. MKIA:When you found out that your third child would have special needs, how did you react to the news? I was followed very closely by a High Risk Obstetrician throughout the pregnancy. I was cleared the entire pregnancy and told that no congenital problems were present, but I still prepared myself for the unexpected. After all, doctors can be wrong. 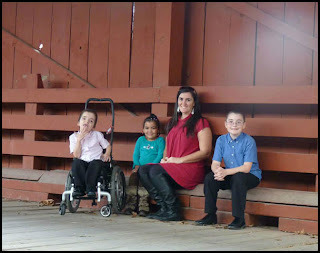 It was because of the preterm birth that my third child developed special needs. I knew it was a possibility so I handled it in stride. I was not entirely shocked, but I was disappointed that I would be facing more challenges for my third child. MKIA:How has this situation affected your view and outlook on life? I mean, has this situation changed you in any way? Ms Courtney Schulist This entire situation has been a positive life changing event. I have learned how to expand on certain qualities of myself that make me a better parent like being outspoken, being happy despite tough times, being compassionate, and not being afraid of living in the moment. I embrace the saying “Come what may and love it”. You cannot choose what happens to you, but you can choose how you react to it. MKIAWell said...Does your faith play any role in the way you are able to handle this situation as a single mother and still persevere? Ms Courtney Schulist My faith grew when I had my third child. Before, I wasn't terribly religious and I was more “lost” than “found”. I questioned how an individual could possibly go through a rough experience multiple times and still come out strong. How one person could suffer so much disappointment, and not be broken. But I realized that I had nothing to do with it. My strength was because of God. I realized that there was something bigger that was helping me through the tough times, and once I began to give credit to God, things began to get even easier for me. I was never one to let the situation overwhelm me, and I knew that even though there were multiple struggles, and life threatening situations, that my children would be fine. As I sat with my children in the hospital, I read my Scriptures and found comfort in the word of God. Hebrews 12:1-2, was one that always gave me comfort. My faith became stronger as a result of my situation. Situations with my children could change quickly, but one constant factor has been my faith. MKIA:I understand you homeschool your children right? Ms Courtney Schulist Yes, I homeschool all of them. MKIA:Did you make the decision to homeschooll your children because of their special needs? Ms Courtney Schulist My decision to homeschool was based mostly on the needs of my children. My middle son has a very weak immune system, and a common illness in a healthy individual can lead to a serious hospitalization for him. By sending him or my others to a public school, the risk of transferring illnesses was very high, and I was not willing to take that risk so I homeschool them. Most people with chronic special needs look different, and often have physical characteristics that make them stand out. Because of that, people treat them different and are often cruel to them. I did not want my middle child, or my other children to be bullied because of their special needs. MKIA:That makes a lot of sense. There are lots of single mothers in your situation. And you know, they might feel ddiscouragedbecause they think their child is not improving, or not improving fast enough and they become overwhelmed. What would you say to those mothers out there? How would you encourage them? Ms Courtney Schulist It is far too easy to become overwhelmed when you are facing a child with special needs. I would encourage them to focus on what their child is capable of doing, instead of what their child cannot do. Having a special needs child means celebrating different milestones than those of a typical child. If you dwell on the negatives, then you are only feeding negative thoughts and your child can pick up on that. I would also tell them to be happy, and find joy in all situations. Be aware of all that could happen and know that things can quickly change. MKIA:You have very good advice. But I have to ask this: do you plan on having anymore children? Ms Courtney Schulist(Laughing)…Everybody asks that question. Personally, I would love to have more children, and even adopt special needs children, but I am leaving that decision up to God. MKIA:Once again, I thank you for this opportunity and for being an inspiration for others. Ms Courtney SchulistThank you for taking the time to allow me to share my story. I hope that it is an encouragement and inspiration to others.